The New York Film Academy offers a wide array of summer camps for teens and camps during the school year designed for high school students who are looking to get their hands on industry caliber equipment and start realizing their visual and performing arts dreams. Whether it’s working with HD cameras in exciting locales, learning to dance in professional studios, or using industry standard 3D animation software, students at the Film Academy’s teen camps and programs get the chance to truly learn through hands-on experiences. Each teen camp is built around a challenging and intensive curriculum that combines in-class instruction with faculty-supervised workshops where students get to put to use the lessons they learn. We require that participants bring the discipline, commitment, patience, and passion to explore, to work collaboratively with a team—to lead, and to problem-solve. These camps for teens encourage the students’ creative, physical, and organizational abilities. 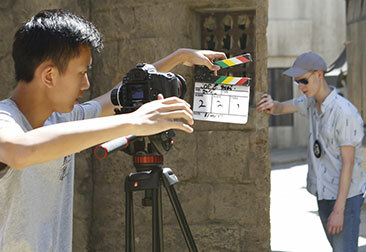 The New York Film Academy offers a variety of intensive summer filmmaking camps for high school students, spanning from one week to six weeks in length. These camps are taught at a variety of locations in the United States and abroad. 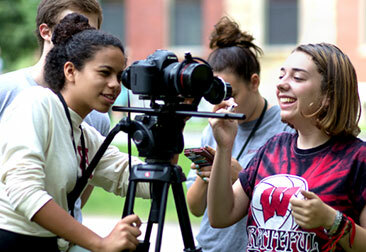 We also offer 12-Weekend Film Camps during the school year and a 2-Day Holiday Film Camp in December. All students completing the film program will have the opportunity to write, direct, and edit their own film projects that they will take home on a flash drive. In line with the mission and philosophy of the New York Film Academy, these programs are intensive and focused on hands-on learning. NYFA’s Acting for Film camps are focused on equipping students with the practical knowledge they need to deliver a fantastic performance on-camera. These acting programs combine traditional training with courses geared towards building acting techniques for the screen. Cameras are used in class exercises and longer programs may collaborate with filmmaking classes to provide additional on camera time. The acting workshops follow our philosophy of total immersion, and as such require a full-time commitment. Students can also enroll in our Weekend Acting Camp and our 2-Day Acting Camp to expand their abilities as actors in a brief amount of time. Designed for aspiring musical theatre performers, NYFA’s Four-Week Musical Theatre Camp is an immersive experience like no other. Students study under Broadway professionals to learn the foundational skills of musical theatre while studying in either New York City, the home of Broadway, or at Harvard University, which boasts a rich theatre scene. Through study and hands-on practice, students are trained in the fundamental principles, techniques, and craft of broadcast journalism in our Four-Week camp. This is accomplished through a combination of lecture, demonstration, in-class hands-on production, and the students’ own work. Whether you’re interested in learning how to create an original 3D animated short film or simulate realistic visual effects, NYFA’s Three-Week and Four-Week 3D Animation Camps, offered at Harvard University and our NYC and LA campuses, provide students with professional instruction to give them a strong footing in the field. Designed for those creative individuals who prefer to create exciting and new stories through their words, NYFA’s Four-Week Screenwriting Camp immerses aspiring screenwriters in the craft of writing scripts, with no prior experience needed. If you’ve ever wanted to see if you could write your own movie, then this is the camp for you. With photography becoming part of our day-to-day lives—from selfies to Instagram posts and everything in between—it’s become more important than ever for serious photographers to create truly original and one-of-a-kind work. NYFA’s Three-Week and Four-Week Photography Camps immerse students in the world of a professional photographer as they are challenged to produce professional-caliber work. From blockbuster console games to the ever-growing mobile game market, video games are everywhere you look. At NFYA’s One-Week and Four-Week Game Design Camps students work with our faculty of professional game designers to learn the fundamentals of game design and obtain the skills they require to create their own games. Offered at the Academy’s LA campus, the 4-Week Documentary Camp is designed to provide high school students with a hands-on and intensive introduction to the craft of documentary filmmaking. Students are immersed in the creative and technical demands of the craft while gaining experience working with industry standard equipment on original projects that apply what students learn in camp to original video content. Offered at the Academy’s LA and NYC campuses during the school year, teens have the chance to study filmmaking and/or acting for film in an intensive and hands-on environment for twelve Saturdays. From establishing a strong foundation in the crafts of filmmaking and acting for film to gaining experience in working in front of and behind the camera, the 12-Weekend Film and Acting Camps for Teens are a great way to study the performing and visual arts during the school year. Held at the Academy’s New York and Los Angeles campuses during the holidays, we offer 2-Day Holiday Camps for Film and Acting. Whether a student lives in NYC or LA, or is visiting during a break in the school year, the 2-day camps provide a challenging and rewarding introduction to the crafts of film and acting for film, with students establishing a groundwork for future study. Interested in applying today or getting more information? Click here to apply and learn more.